Daily POP Crosswords Is Here! Hello friends and fellow PuzzleNationers! Come one, come all, because we’ve got a very special announcement for you all! So special, in fact, that we’re doing a special Wednesday post for it! 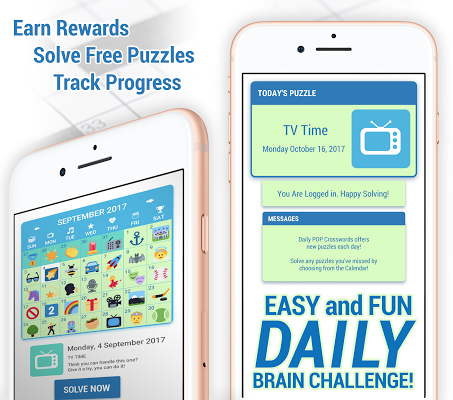 We have a brand new puzzle app for your enjoyment! Say hello to the best new crossword app on the market today: Daily POP Crosswords! Available for both iOS and Android users, Daily POP Crosswords takes the topnotch cluing and well-constructed grids you expect from PuzzleNation and goes one step further. We’re talking about pop culture-fueled themed puzzles from world-class constructors! Free themed daily crossword puzzles right in your pocket every day! Each day has a different pop culture theme, running the gamut from music and movies to sports and history, so no matter what piques your interest, we’re guaranteed to have a puzzle for you! And yes, we did use the magic word. 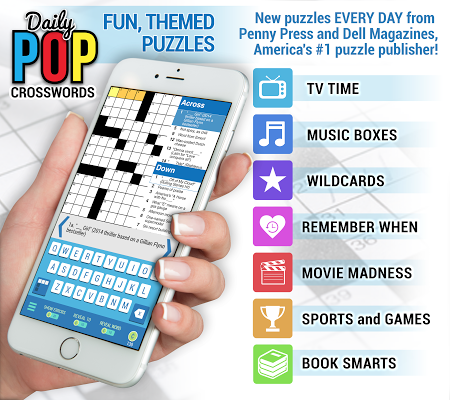 Daily POP Crosswords is free to download and free to play! Plus, you get all of the terrific features you know and love! The pop-up clue screen keeps your grid clear and easy to access! Our optional Smart Step navigation helps you fill the grid by jumping from one entry to the next, building upon the letters you’ve already placed! Our Hint feature can reveal letters or even whole words if you get stuck! Daily POP Crosswords is without a doubt our best app yet, but you know what? Don’t take my word for it. Check out this quick video preview of the app in action! With fantastic new free content every single day, you can’t go wrong with Daily POP Crosswords! This entry was posted in Games, PuzzleNation, Puzzles and tagged About Us, android, Announcements, apple store, Cluing, crossword, crossword app, crosswords, Daily Pop, daily pop crosswords, Geeking Out, google play, IOS, Penny Dell Crossword App, Penny Dell Crosswords App, Penny Dell Puzzles, Penny Press, Penny/Dell Puzzles, Pop culture, Puzzle App, PuzzleNation, Puzzlin' fool, Wordplay by gmdirect. Bookmark the permalink. Daily Pop Crossword Puzzle is not working. What is the problem? What device do you use to play Daily POP Crosswords?